At Michael & Son Charlotte, we’re proud to offer drain cleaning services to Gastonia, Rock Hill, and other cities in the Charlotte, NC area. We have been in business for more than 30 years and are known for providing drain cleaning service and other plumbing repairs. Do you have a clog in your plumbing that won’t go away? Clogged drains can be an indicator of an existing problem and should be inspected promptly. Drain cleaning in Charlotte and surrounding communities is just one of the services that our experienced plumbers provide to our residential and commercial customers. At Michael & Son Charlotte, we use the most powerful drain cleaning solutions available on today’s market. We can quickly remove unwanted debris from your drains using modern, state-of-the-art equipment. Our drain service in Charlotte can quickly improve your drainage and ensure that your newly-cleaned drains stay clear. Drain cleaning in Charlotte performed by our experienced plumbers will help to restore flow and function to any type of clogged drain! Store-bought “liquid plumber” solutions may cause even more damage to pipes if you try to perform these repairs yourself. Since your kitchen and bathroom drains eventually lead to your sewer system, it’s paramount that you call a professional to fix your plumbing problem before a major problem occurs. 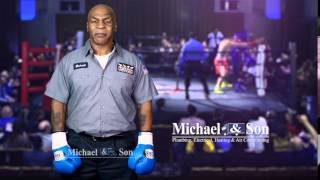 Call Michael & Son Charlotte today for affordable residential or commercial drain cleaning. We will respond quickly and provide you with the high-quality service you need at a price you can afford! We proudly serve Charlotte, Mooresville, Gastonia, Salisbury, Concord, Harrisburg, Huntersville, Cornelius, and Matthews NC, and Rock Hill SC.